FAI Third Level Football - News.php - Item.php - Talking Point - Can UCD be stopped? talking point - can ucd be stopped? 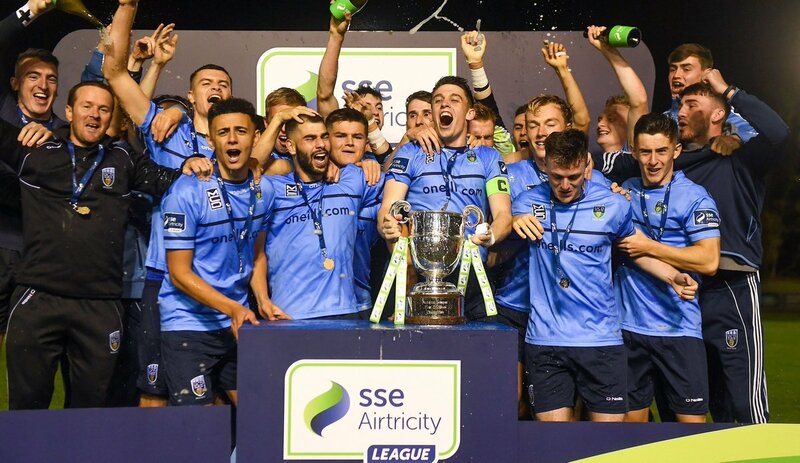 With a bulging trophy cabinet and one of the most young and exciting sides in Irish football at the moment, is there a team that can derail the Students Train? UCD were ruthless as they opened up their defence of the CUFL Premier Division with a 7-0 defeat of old rivals Trinity College in the Bowl this week. In the last twelve months, they First Team have played forty-four games in Club and Third Level Football. Of those games, they won 31, drew 6 and lost 7, giving them a 70% win rate. The seven defeats were to DCU (0-1) in the 2017/18 CUFL, Drogheda United (0-2), Galway United (0-2), Cabinteely (0-2) and Longford Town (1-5) in the SSE Airtricity League Division One, their 1-0 defeat to Dundalk in the FAI Cup Semi-Final and a penalty shoot-out defeat to Bohemians in the EA Sports Cup Second Round. Three of their six draws came in their final four Division One games with the finish line well in sight. The unique system they have developed in Belfield with all of their SSE Airtricity League side studying on a scholarship, making them eligible for the CUFL, makes them the envy of all Third Level sides who aspire to creating a similar system with the level of playing talent that UCD possess. They will be tested by the likes of Maynooth University and UCC who have built strong Intermediate standard teams within the Leinster and Munster Senior Leagues with a sprinkling of SSE Airtricity League Senior and U19 players. IT Carlow and Dublin IT also possess opportunities to ask questions of Diarmuid McNally's CUFL team with the roster of players they have assembled for this season. However, all sides who line-up against UCD in this year's Third Level Football season will have an underdog tag smacked on them and will need to be at their very best if they are to stop Gary O'Neill lifting UCD's third CUFL Premier Division title in a row.